Highway rated trailer with 1/2 ton suspension. Cart Weight 540 lbs (245 Kg) approx. empty. Dry Storage Under counter space. Food Equipment Summary Triple Steamers BBQ. Additional Standard Features 12 volt DC Pressurized Hot and Cold Water System. Removable Trailer Hitch. Cart Push Handles. 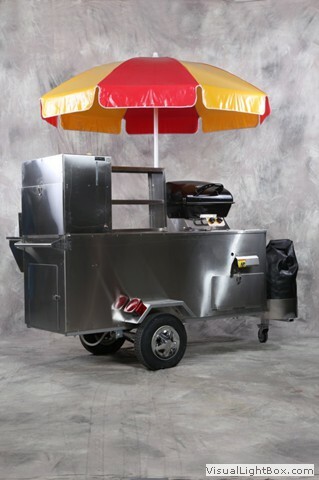 Additional Equipment Options Single Fryer, Dual Propane Tank Baskets, 6 Condiment Tray, Chip Clip, Dog Sled, Spare Tire. See the Accessories pages for a complete list of optional equipment.